Among the millions of Americans suffering from post-traumatic stress disorder (PTSD) are many veterans who have transitioned out of the service. PTSD symptoms vary from flashbacks and nightmares to night sweats, nausea, even severe depression. If you or someone you know has PTSD, help is available. Treatments range from traditional to alternative therapies. One alternative therapy currently used to treat veterans with PTSD is the Warriors and Wolves program at Lockwood Animal Rescue Center (LARC). 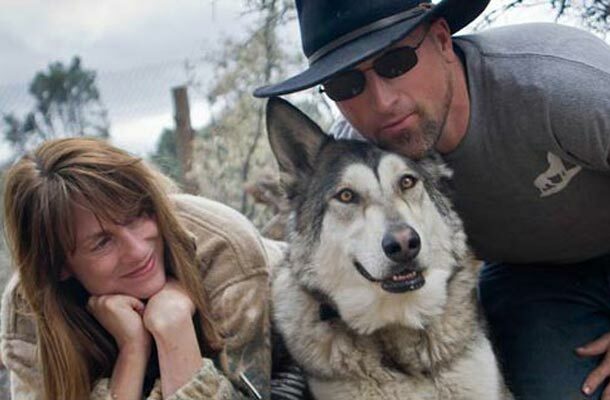 Located in Frazier Park, California, this program encourages veterans to bond with rescued wolves and abused wolf dogs. Co-founders Navy veteran Matt Simmons and clinical psychologist Dr. Lorin Lindner believe working with rescued animals helps those with PTSD heal. As a Desert Storm veteran who suffered from PTSD, Simmons knows from experience this type of eco-therapy works. Simmons volunteered in a therapy program that brought traumatized veterans together with traumatized exotic birds. The experience changed Simmons’ life for the better. Veterans participating in Warriors and Wolves are LARC employees and volunteers who participate in stream-bed restoration projects and care for rescued wolves and wolf dogs permanently living at LARC. Similar to combat veterans suffering from PTSD, these animals are outsiders too often misunderstood. The inner turmoil the veterans and wolves experience bonds them. The result is a healing process that leads to a sense of belonging. While PTSD symptoms usually start soon after a traumatic event, they may not occur for months or even years after being in combat. If you know someone who may suffer from PTSD, encourage him or her to get help today.